The fashion statement made with monogram earrings can range from classic and elegant to quirky and fun, and the personal nature of a monogrammed piece of jewelry makes them a fantastic gift. Frederick Engraving offers a beautiful selection of designs and styles, so you’re bound to find the perfect piece to suit your needs amidst our array of monogram jewelry. Ever popular, the look of an individualized set of earrings can offset any outfit with a fantastic personalized touch. Whether you’re buying for yourself or searching for the ideal present to commemorate a birthday, graduation, or other special occasion for a loved one, our countless product options will help you choose a set of earrings made with the greatest individualized flourishes. 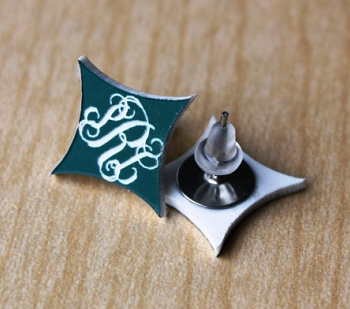 You won’t find another source for classy and stylish monogram earrings at prices and quality like we at Frederick Engraving provide. Our selection of monogram jewelry covers all bases. We sell necklaces, bracelets, cufflinks, rings, and of course the earrings you’re searching for. You can find both studs and dangle earrings in our shop. Our studs come in two tone colors or metals for simple sophistication, or you might like our earthier alternative wood-stenciled stud earrings. Our dangle earring options are wide, from single initials in a variety of text styles and made from carefully cut plastic or wood, to engraved or cutout discs with all initials featured. For a beautifully classic touch on a gift for a loved one, or a unique accent option to accompany a special outfit, take a look at Frederick Engraving’s monogram earrings and you’re guaranteed to find a perfect match to your desired style and expression.